Make sure the security code you are entering is correct. If you have a Visa, MasterCard or Discover, it's the 3 digits on the back. American Express its the 4 digits on the front. If all of the above are correct, we suggest that you try a different credit card. If you are paying through PayPal: Be sure to use an e-mail address and credit card not associated with any existing PayPal account. If these steps do not work, it's likely that the payment processors security algorithms are rejecting the transaction. But don't worry, we can help! Give us a call at 707-340-3863. If you want to pay by credit card, but didn't see that option, it's because the couple did not enable online payments. We give couples the choice because online payments incur a fee. You can pay simply and free of charge by sending the couple a check in the mail or presenting cash/check to the them in person along with your Honeyfund gift certificate. To confirm if your payment went through, please check your e-mail for a receipt for payment (it comes directly from the credit card processor, PayPal or WePay). Another way to confirm is to check for the charge(s) on your credit card. If you do not see a charge nor have a receipt, you may have chosen to pay offline. If so, the link in your Honeyfund gift confirmation e-mail will provide you with additional instructions. Otherwise, please try your gift again. To get back to the certificate page, please click the link in your gift confirmation e-mail (check your spam folder if you didn't receive the e-mail). Visit the couple's registry page. Enter the giver name and e-mail into the form exactly as you entered it the first time. We will automatically pop-up a message linking you to your existing gift! If you still can't recover it, click Contact Us below and we can provide the link to you. If you have NOT paid for your gift, please click the link in your gift confirmation e-mail from Honeyfund. There you can cancel the gift pledge. If you don't have the e-mail, contact us and we can cancel the gift pledge for you. If you have already given the couple the funds, offline, we cannot cancel the gift payment. 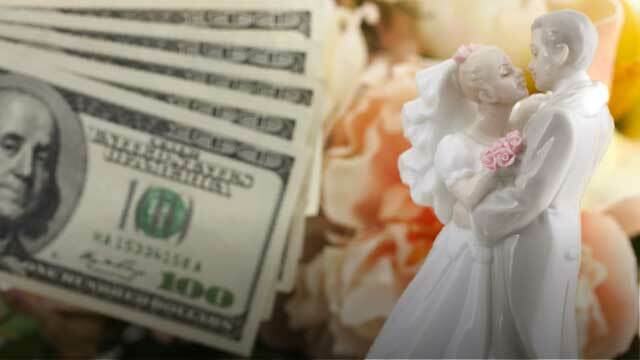 You will need to make arrangements directly with the couple to retrieve your funds. If you paid online, some paid gifts may be refundable. Please contact us to inquire if your gift may be refunded. The name and amount of the gift you want us to refund. There are three ways a couple can receive gifts, depending on which options they have selected for their account. If you choose to pay online, the funds and certificate will be available to them immediately. Couples can choose to have the money sent to them directly or redeem their Honeyfund Balance with one of our partners. 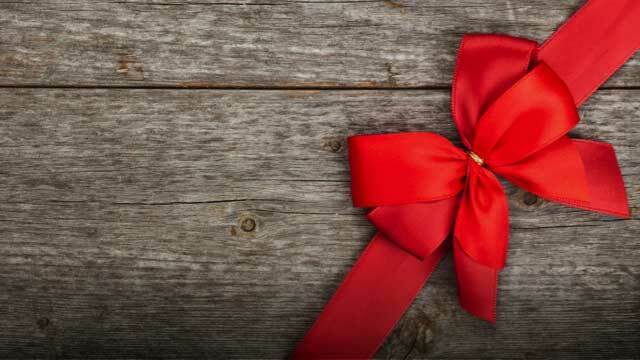 When you reserve the gift, choose to pay offline (cash or check) and use the name "Surprise." You can change the name on the certificate before printing. Then you can print the certificate and give it to them at your chosen time. 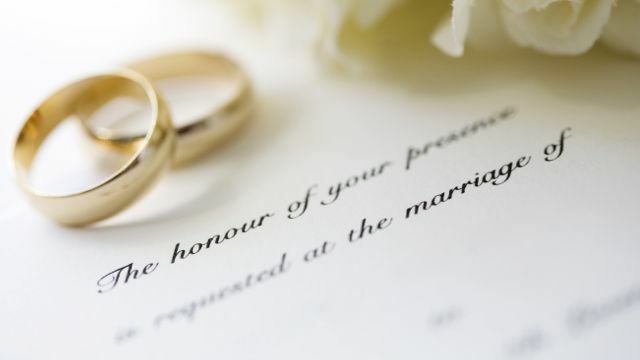 Please note that your email address is shared with the couple, we suggest using an email address that is not recognized. If you pay online with a credit card, your identity will be revealed to the couple through the payment processor. Yes! Since what you are giving them is a money toward their honeymoon fund, you can still contribute even after the wedding or honeymoon. They will most likely use the funds as a reimbursement for the cost of the item you selected. With Honeyfund, you receive monetary gifts from your guests to help you pay for the costs of honeymoon travel and more! You book and pay for your travel with a great deal from one of our travel partners or with your own travel provider. 1. The first and most popular is the new Honeyfund Balance! Receive gifts with zero fees, then redeem the balance for one or many gift cards from our partners. Guests pay online with a credit card, and you decide how much and which gift cards to choose. There are zero fees to you or your guests! 2. Accept credit card payments from your guests that come to you as cash. Guests choose a gift(s) from your list and pay online with a credit card. The money goes into your own account with the card processor you choose, and then sent via direct deposit to your bank. Credit card payments are powered by either WePay or PayPal (2.8%+.30* (US) per transaction). 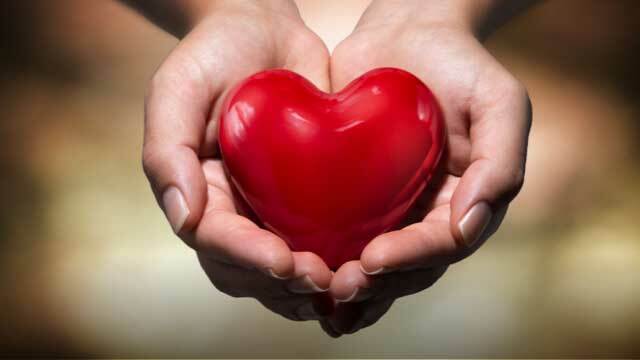 There are never any fees to your gift givers! 3. Finally, receive cash or check from your guests, offline. Your guests will reserve gift items, print a gift certificate and literally give you cash or check either by mail or in person. 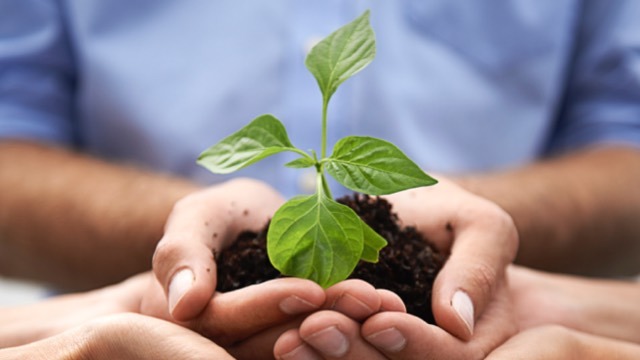 Take a look at some of our Starter Registries for ideas on how to create your Honeyfund. * Applies to most US-to-US payments. Fees outside the US may vary. Click here for full fee info. Payments via PayPal from outside your home country may incur an additional 1% cross-border fee. 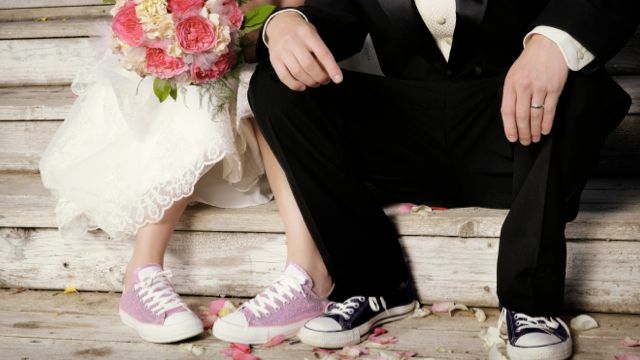 Honeyfund is the first honeymoon registry to offer no-fee credit card payment processing! The new Honeyfund Balance allows you to take guest payments into your Honeyfund account and redeem the funds as you wish through our network of gift card providers. And there's NEVER a fee to guests, either! 1. Choose offline gifts, where guests reserve an item and either mail or bring cash/check to the wedding. No fee! 2. Make your page stand out with Honeyfund Elite, the most powerful design tool on the wedding registry market. Elite includes your choice of design templates, cover photos, photo slideshow and registry items, password protection, no ads, and more. Just a $39.99 one-time fee. 2. Opt for cash payments via our integrated payment solution powered by WePay (US and Canada only), or via your own PayPal account. What does Honeyfund REALLY cost compared to other sites? 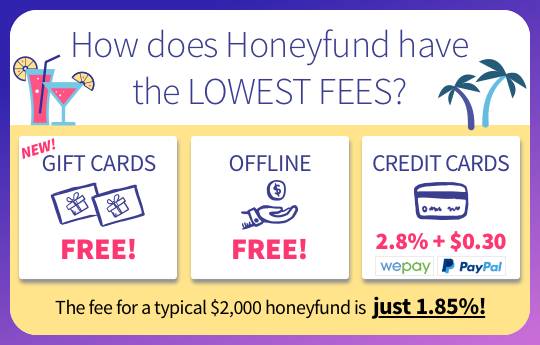 Honeyfund is committed to 100% free options, so our users pay the lowest average fees in the industry! Never any fees to givers. (2.8% + $0.30 USD). See international rates here. Remember, the NEW Honeyfund Balance and gift card registry are FREE! You can accept credit card payments with both free and upgraded Honeyfund accounts. 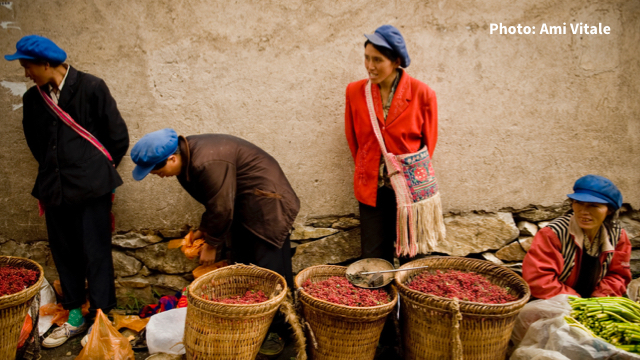 Honeyfund couples who accept both offline and online payments pay average fees of just 1.8%! Guests never pay a fee. * Applies to most US-to-US payments. Fees outside the US may vary. Click here for full fee info. Payments from outside your home country may incur an additional 1% cross-border fee. We make it easy to "publish" your registry at sign up so it shows up in the Gift Giver search. However you may have chosen to protect your registry and not publish immediately. When your registry is ready, head on over to the Share page to begin sharing your page by providing a URL/Hashtag. Click the Share link to edit and save your Honeyfund URL/Hashtag. For security purposes we keep your password info in an encrypted form, so we aren't able to send that to you. However if you click the "Get Help" link on the Sign In page you can enter your e-mail address that will give you instructions for resetting your password. Click the check box next to "Remember me on this computer" when you sign in, so you won't have to re-enter your password again. Your Honeyfund account will be disabled if your e-mail address is invalid or if it was not confirmed within eight weeks of opening the account. 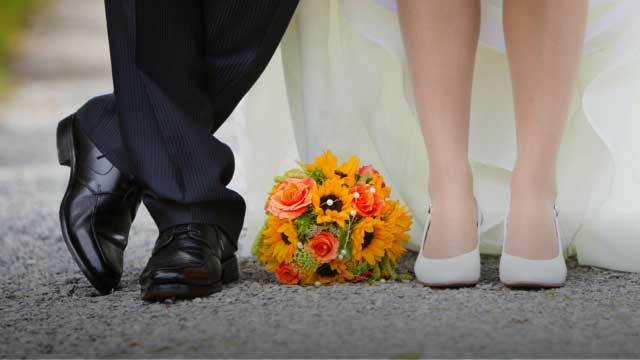 Accounts can be closed in the Contact Section, or if it has been more than one year since your wedding date. Please click "contact us" below to reinstate the account. Have we answered your question? If not, please contact us. Thanks, your message has been sent. We will respond shortly. Please correct the items above and try again.